Google is the world’s most popular search engine, and intends to stay that way. Its popularity is a reflection of its aim to provide the best possible user experience. Today, that means a secure experience, which is why Google now boosts a site’s SEO (Search Engine Optimisation) ranking if the entire site is secured by HTTPS. Essential to a site’s success, SEO helps businesses to be found, so higher ranking means more site traffic. 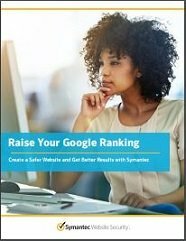 By receiving this whitepaper you are agreeing to be contacted by Symantec representative for product news, promotions, security alerts and to enquire about your potential product needs.